Often confusing and embarrassing, the denial of a credit card application can be sign of other things going on, some of which you can fix and some of which you can fix, but not easily. 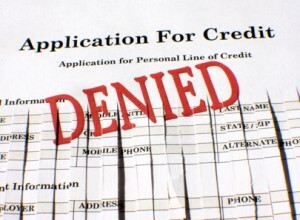 There can be literally hundreds of reasons why you got denied, but really only a few are the most common ways in which you get denied for a credit card. Lets explore some of the main reasons and delve into the ways to help fix them. There are major reasons why you are denied credit cards and the major ones are listed above, we will discuss them to follow, but in there will be peppered with many sub categories that have a related effect on why you credit application was denied. Often there are ways to fix them. Charge-offs are probably the worst thing that you can have on your credit report, they show a complete lack of payment, and collection to the point that your creditor just gave up, and charged it off. This alone can be the sole reason for a denial of a new card, why would they want to give out a new card to you if they feel, based on prior history, that you may not pay. Now over time these accounts will fall off and be out of view, but applying to soon after a charge-off without a real compelling reason, is sure to get you denied. A way to fix that is to pay it off in full, and then once paid off, ask the creditor to remove the negative report. High balances on other open accounts too will surely get you that denial letter in the mail, reason being is that you may be extending yourself to far and that you are not able to meet your financial obligations monthly. Or you may have to many inquires on your credit report, these can be from new applications or from existing accounts accessing your report due to a concern for creditworthiness. They may be monitoring your credit report in an effort to determine whether they are going to continue to extend credit, or increase credit. If you really want a new card, perhaps for a better interest rate, you should pay down your debt and apply again once that has been done. Having to many open accounts even without high balances will result in a higher denial rate, reason is that if you already have access to open lines of credit, there really is no need for any additional accounts, and will result in the denial of the credit card application. Although, this may not seem like a risk factor in the denial process, it does show a history that could be deemed negative. Try closing out the cards that you no longer need or use, why keep them open if you are not going to use them anyway. But on the flip side of that you may have a completely new or unknown credit history. Everybody has to start somewhere, and unfortunately, sometimes, applying for a credit card is not the place to start. You may want to foster a relationship with a bank or credit union, and establish a history there and apply for a card through them first, and get a record established. Or get an auto loan, which often times is easier to get than you may think, this is a wonderful way to establish your credit before applying for credit cards. As you can see, there are many reasons why a credit card application can be denied, but there are ways to fix them, in the short term, and the long term, some are easy to do, others not so much, but that is only going to help you in the long run. The four major areas are the charge-off accounts; having to many open accounts; to high of balances; and, no credit history at all. Intermixed with all of these you could have factors of late payments, public records (lawsuits, or bankruptcy) or you may have just not filled out the credit card application completely, which is a very common mistake. But make sure that when and if you get denied, you take head of the denial issues in the letter they send you, it will give you the exact place to start your rebuilding process, and with some hard work and dedication to yourself you can regain your credit report and score to a respectable level, and in turn be able to apply in the future for accounts with the fear of it being rejected.